Green-up is the same as using the cash-out feature on the Betfair website. It enables you to spread your profit (or loss) evenly across all outcomes, so that you win the same amount whatever the result. You can green-up each runner, either on the ladder or the exchange view grid. A - Click this button to green all matched bets on all runners in the market. This will also cancel all unmatched bets on the market (but you can disabled that feature in the program's settings). B - Click this to green all the matched bets on just that one runner. Unmatched bets are not cancelled. The little green boxes show the green profit available, they expand to show a number when you have money to green or red up. Simply click that green box to green up the runner that the row applies to. 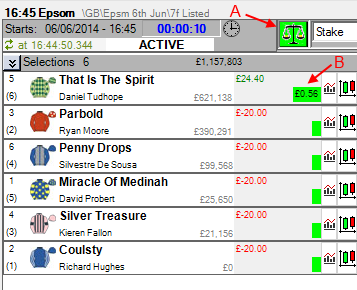 Green To is the same as the cash-out profit on Betfair. Green Stake is the same as the cash-out stake on Betfair. C - Click here to green-up / cash-out all matched bets on this runner, at the best available price (2.16 in this example). D - Click in this column (Green To) to choose the profit that you want to achieve if the greening bet is matched at your chosen price. The bet will be sent at the price corresponding to where you clicked (2.1 in this example). Greening on the ladder does not cancel unmatched bets, you can cancel them by clicking the red cancel button. 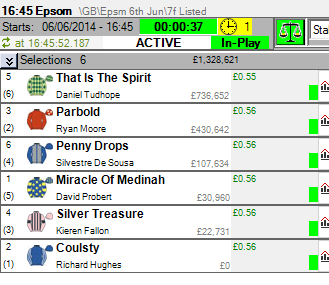 The profit has now been spread evenly across all the runners. In this example the software had to round the required stake to the nearest whole currency unit, resulting in £0.55 profit on one runner versus £0.56 on all the other runners. Generally though the outcome is either exactly equal, or within £0.01. The evenly spread profit shown in the picture above could have been achieved by clicking either A, B or C, because in the example I had only been betting on one runner, so all of these options would produce this same result. 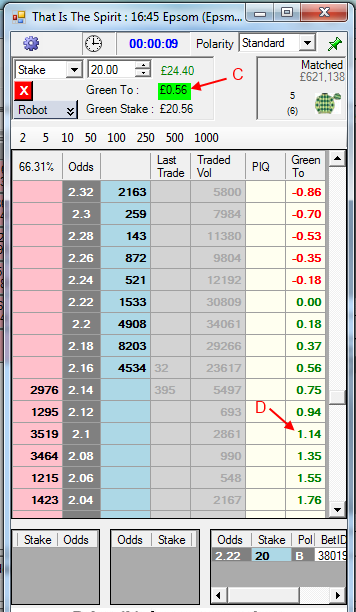 However, if I had been betting on more than one runner and wanted to obtain a fully balanced green result similar to that shown above, then I would have needed to either click A (which always greens the whole market), or click on B or C on each and every runner that I traded.